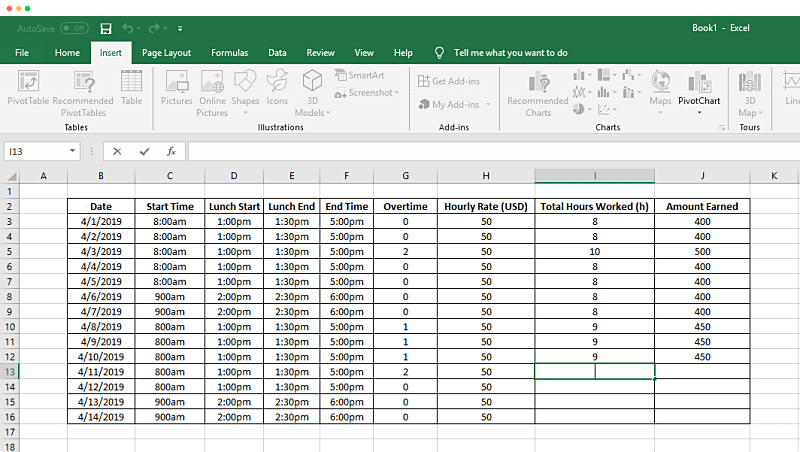 How to track time in a spreadsheet, generate time reports, and improve your productivity. Tracking time in a spreadsheet is vital for keeping the records of the time you’ve tracked for work clear, clean, and easily accessible - you’ll later need this data for HR and payroll, client billing, government compliance (DCAA, FLSA), and project status reports you send to clients. The spreadsheet time tracking method involves entering the time you spend on tasks in a spreadsheet template. 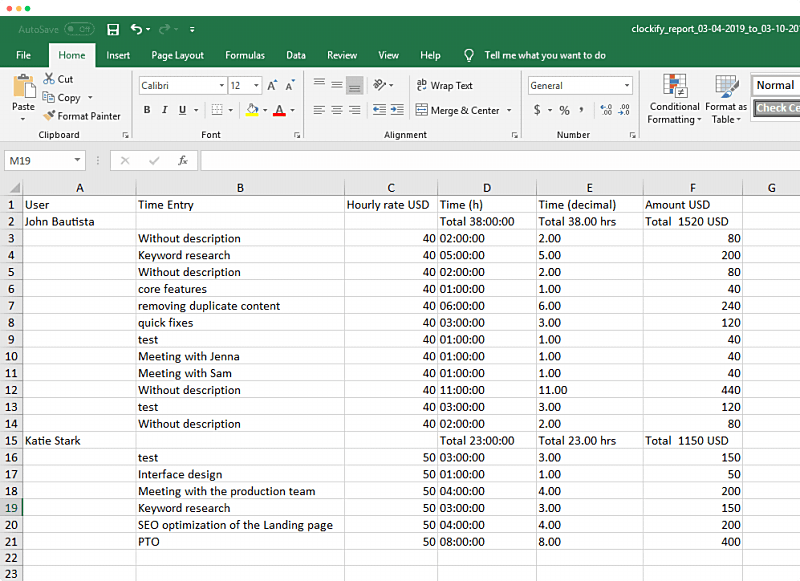 Depending on what you want to see in your timesheet report, you can open an Excel spreadsheet or Google sheet, and add "Start Time", "End Time", "Hourly rate", "Client", "Activity", "Total Hours Worked", "Overtime", "Amount earned", and other parameters you'll need. Then, you'll need to manually enter this data, before sending out the spreadsheet for approval to your supervisor on a regular basis (usually on a weekly, bi-weekly, and monthly basis). You can download free spreadsheet templates (as either Excel or Google Sheets), and fill them out. 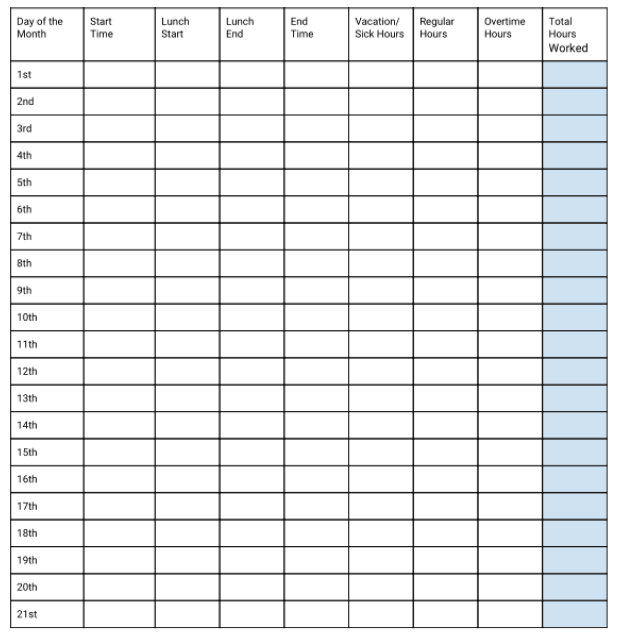 Monthly time tracking spreadsheet with: Start Time, End Time, Lunch Start, Lunch End, Vacation/Sick Hours, Regular Hours, Overtime Hours, Total Hours Worked, Monthly Totals and Pay, and Hourly Rate. 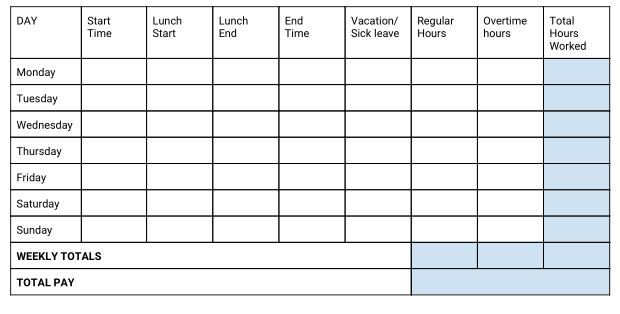 Weekly time tracking spreadsheet with the same data, only presented by week, with weekly totals and pay. 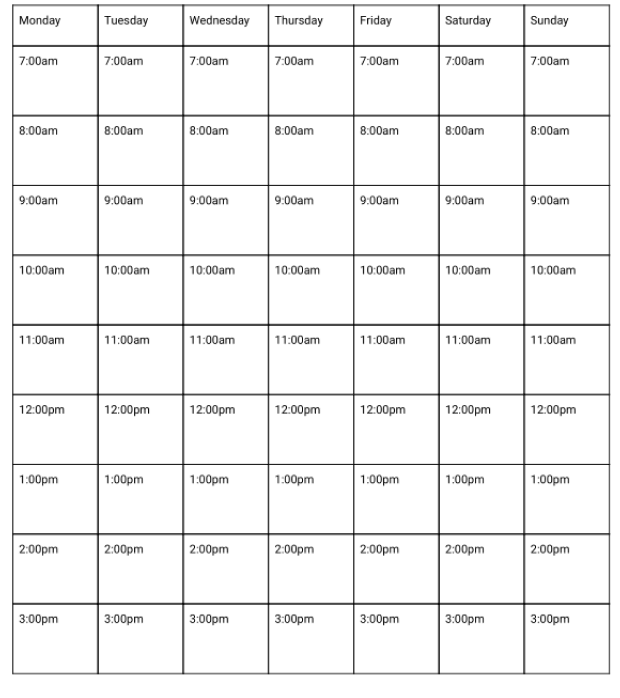 Daily time tracking spreadsheet for employees, with days divided into hours (7:00 AM - 8:00 PM), where employees can enter what they worked on during each workhour of the day. 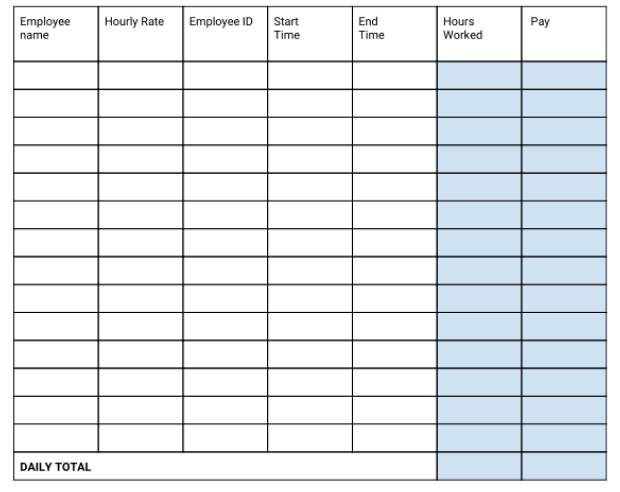 Daily time tracking spreadsheet for supervisors, where supervisors can enter employee hourly rate, employee ID, Start Time, End Time, Hours Worked, Pay, and Daily totals for each employee. 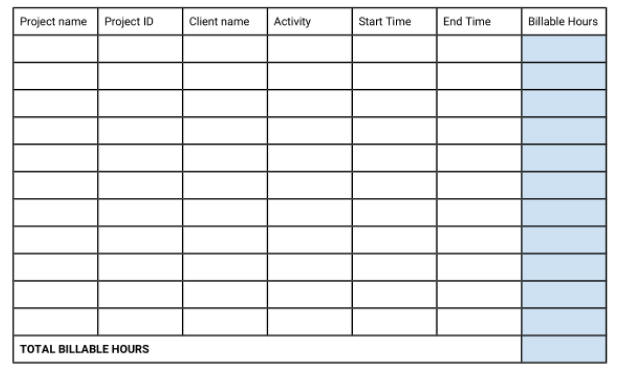 Project time tracking spreadsheet, where you can enter project ID, Client, Activity, Start Time, End Time, Billable Hours, and total Billable hours for each project you worked on. Overall, the traditional spreadsheet method serves its purpose in terms of allowing you to indicate your start time, end time, total hours worked, and other time tracking data in a simple way - but, you'd be best off if you were to automate the process of time tracking in a spreadsheet as much as possible. 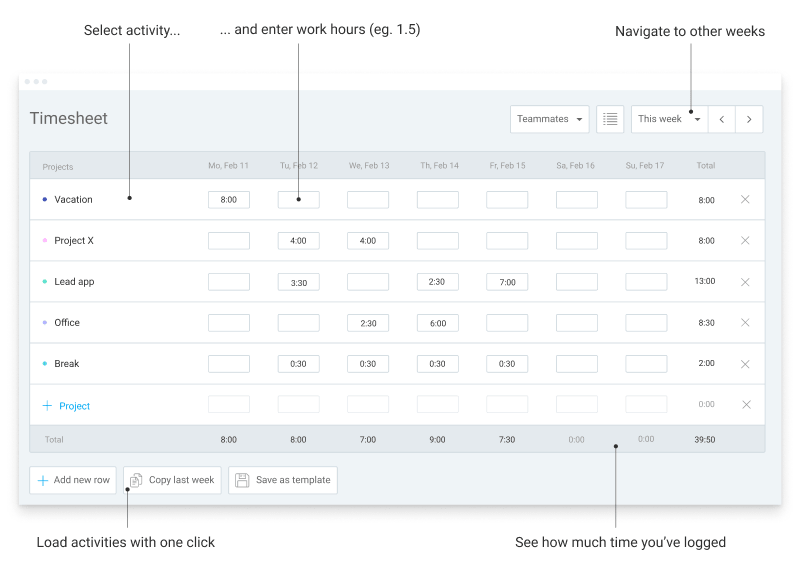 Clockify is a time tracker spreadsheet and timesheet app that helps you improve, speed up, and streamline your time tracking. 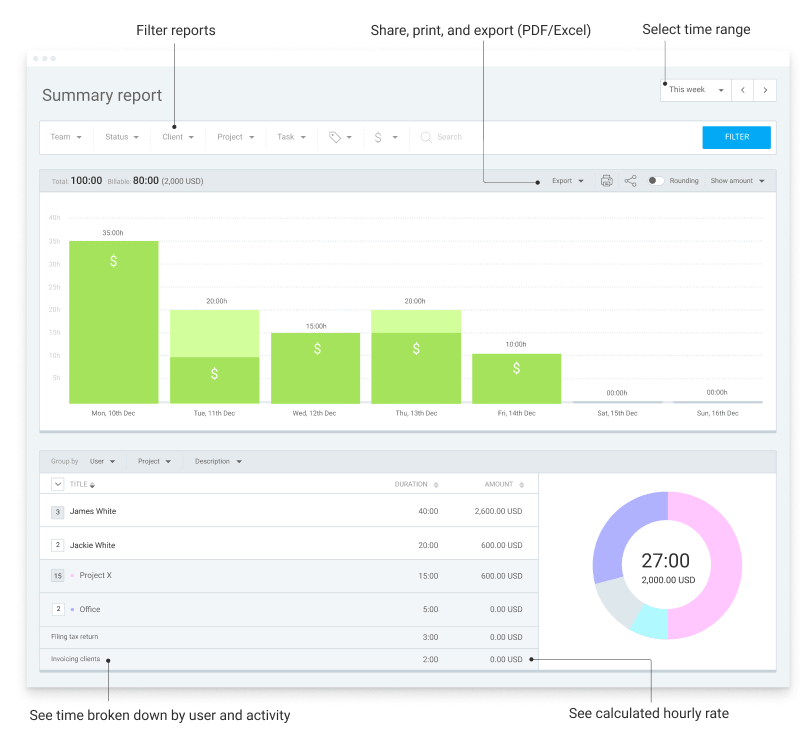 You and your team simply type time in personal timesheet, which Clockify summarizes in visual reports, which you can later share and export as customizable CSV and Excel files. Entering time in a timesheet view with Clockify is similar to handling project time tracking in Excel - you define the project you're working on (this can be a name of a project, but you can also indicate "vacation", "overtime", or "sick leave" as projects), and enter the time you spend on these projects by date in a couple of clicks. You'll be able to download editable CSV and Excel files from the time entries you create in Clockify. Simply choose the type of report you want to create (Summary, Detailed, or Weekly), filter by the desired parameters, and choose a time period. All exported CSV and Excel spreadsheets are editable, in case you find that you need to fix some data. Once you've generated the desired Report, you'll be able to export the results as a CSV or Excel file, in order to get a spreadsheet template with the usual spreadsheet data automatically filed out. And all it takes is a couple of quick clicks. If you export a Summary Report, either as a CSV or Excel document, you'll get full data filled out by the User who tracked the time, Time Entry, Hourly rate in the desired currency, Time (in hours and decimals), and Amount earned, also in the desired currency. 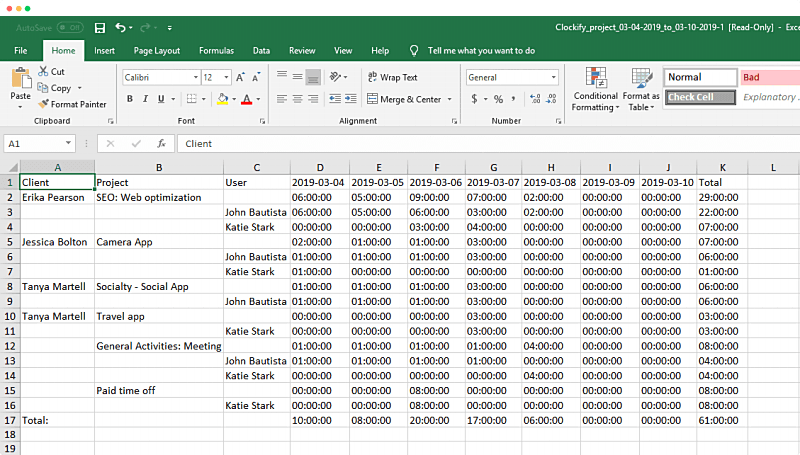 If you export a Detailed Report, either as a CSV or Excel document, you'll get full data filled out by Project, Client, specific Time Entry, Task, User who tracked the time, User's email, Tags, Billability status, Start Date, Start Time, End Date, End Time, Duration (in hours and decimals), User's hourly rates in the desired currency, and the Amount earned, also in the desired currency. If you export a Weekly Report, either as a CSV or Excel document, you'll get full data filled out by Client, Project, User who tracked time, and time tracked by date (in a weekly view).